Currently, Pacific Bluefin Tuna (PBFT) farming production relies on catching wild juvenile tuna and raising them to maturity before distributing the fish to markets. This practice is unsustainable, as it increases fishing pressure on the wild population. The Foundation for Food and Agriculture Research (FFAR) is awarding a $945,000 grant to Ichthus Unlimited, LLC to cultivate PBFT eggs as part of a sustainable model for farm production. Ichthus Unlimited, LLC will establish a hatchery in the San Diego Bay area to cultivate PBFT eggs and grow them to juvenile fish which can then be distributed to tuna farms to mature. Acquiring tuna from the hatchery, rather than from the wild population, should reduce rates of overfishing and help stabilize the wild population. At only three percent of its original population, PBFT are on the verge of being placed on the endangered species list. As the “holy grail” of aquaculture, bluefin tuna can sell for tens of thousands and occasionally millions of dollars per fish. 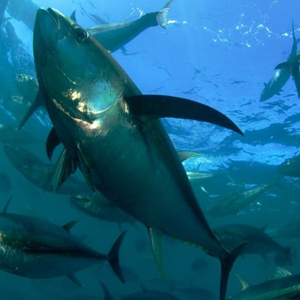 It is estimated that bluefin species products generate approximately $2-2.5 billion in value worldwide each year. Increases in tuna production would also create jobs and economic gains, particularly for coastal communities in California and the Gulf of Mexico. This innovative research has the potential to reduce the overfishing of PBFT, aid in restoration efforts, and stimulate economic growth. Despite the popularity of PBFT, few indoor facilities in the world have the expertise needed to raise PBFT from eggs. The team at Ichthus Unlimited, LLC will collaborate with these indoor hatching facilities and leverage their combined knowledge to successfully implement this practice. FFAR has convened world-renowned experts to develop a practical approach that enhances PBFT egg production, and subsequently, produces more tuna. The private-public partnership includes Ichthus Unlimited, the Illinois Soybean Association, Texas A&M University, and the Spanish Institute of Oceanography. The Foundation for Food and Agriculture Research, a 501 (c) (3) nonprofit organization established by bipartisan Congressional support in the 2014 Farm Bill, builds unique partnerships to support innovative and actionable science addressing today's food and agriculture challenges. FFAR leverages public and private resources to increase the scientific and technological research, innovation, and partnerships critical to enhancing sustainable production of nutritious food for a growing global population. The FFAR Board of Directors is chaired by Mississippi State University President Mark Keenum, Ph.D., and includes ex officio representation from the U.S. Department of Agriculture and National Science Foundation.